Our Hermann Hill Mo Bed and Breakfast is fortunate to have the Showboat Community Theater as the venue for all of the Hermann area performing arts that come to our fine city. 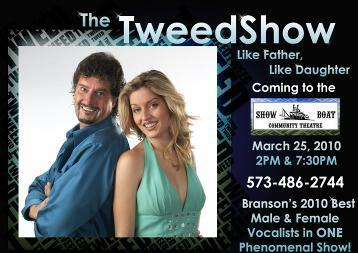 The opening show this year is “The Tweed Show, Like Father Like Daughter” which is a return engagement coming from Branson, Missouri. The father daughter team John and Sarah Tweed, have an all new show with a huge variety of songs with “a little country, and a little Broadway! “There will be two shows on March 25, 2011, 2PM and 7:30PM. Hermann Hill bed and breakfast is situated only one mile from this wonderful theater and would serve as your getaway to relax and enjoy the show. When you come back from the show our signature warm cookies, ice cream, and Hermann Hill Port Chocolate-Raspberry Sauce will be delivered to your room. Just one of the amenities our guests receive when staying with us.